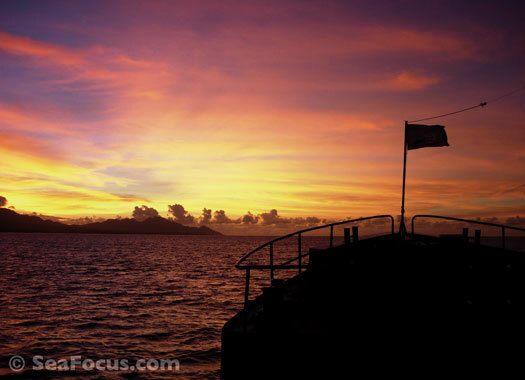 Located north of the city of Manado and opposite the Bunaken Marine Park but about 40 minutes from Manado City. Transfer time from the airport is around 30-40 minutes. 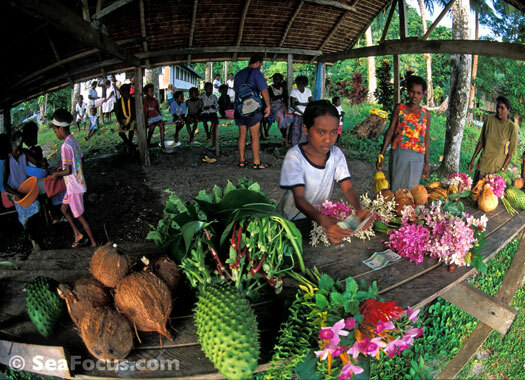 Bilikiki Cruises have been operating in the Solomon Islands for decades. They are the lone liveaboard operator there (others have been and gone) but Bilikiki has become the standard for these waters. The company has two enormous, steel hulled vessels, MV Bilikiki and MV Spirit of Solomons. The two ships are very similar at 38 m/125 ft long, a 24 ft beam and an almost matching deck layout. The only real difference between them is the cabin configuration. MV Bilikiki has ten air-conditioned, guest cabins located beneath the main deck. They all have a small double bed with an extra single bunk above. They are ensuite with a shower, sink and toilet. The cabins are simple and straightforward but with reading lights and space beneath the bed to store bags. There are no windows or portholes but we found we spent little time in the cabin as there is plenty of relaxing space elsewhere on the boat. 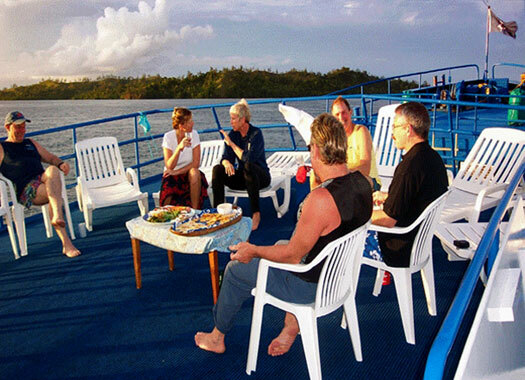 On the main deck, the bow has a casual open-air area with tables and chairs where most meals are taken. Directly behind is the salon and bar with more tables. There wasn't a specific camera work room on Bilikiki, so this space was overtaken by photographers on our trip. At the stern, is the dive deck. The upper deck is better known as the cocktail and sunset deck with another relaxing area, the wheelhouse, library and a lounge. Note that since our trip, there has been a small camera room added beside the lounge. Meals are mostly buffets and reflect an Australian style of cooking with plenty of salads and vegetables. 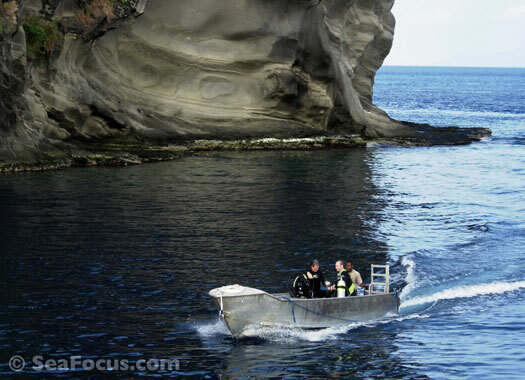 Buying fresh produce from local traders is a daily event as they deliver to the dive deck by canoe. There is a wide variety of meals throughout the cruise and no two were ever repeated. While all meals were good and tasty, our favourite was the sunset cocktail and canape hour. 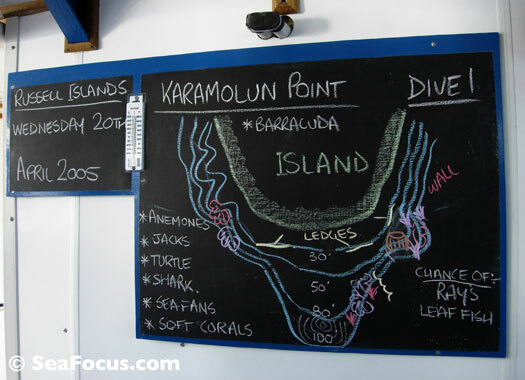 Every evening after the last dive, the crew would prepare a selection of cheeses, cold meats, olives and so on to be enjoyed with a cold drink while discussing the days diving. We have great memories of chatting, nibbling and watching the sun go down. 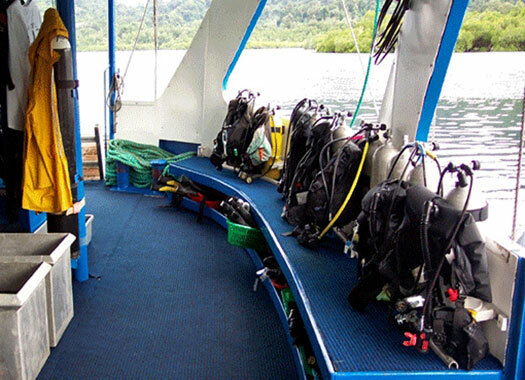 The dive deck is another great strength of this boat, with tank stations running around the rear of the vessel allowing everyone good kitting up space. Everyone gets a storage basket for peripherals, there is a camera rack, wash tanks and the usual hanging spaces for suits. 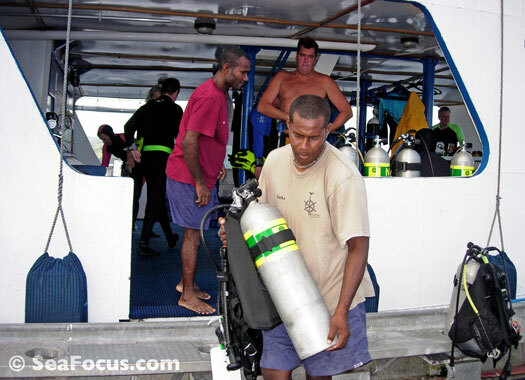 Diving is done from aluminium 'tinnies' and – our other favourite aspect of Bilikiki – is that there are no specific dive groups. As soon as a few divers are ready, you walk to the tinnie, and off it goes. 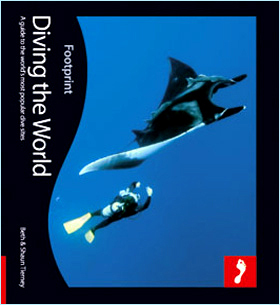 This meant that the dive schedules ran smoothly and there were no frustrations with slower divers holding up others. The crew on the boat were all helpful, charming and friendly. The cruise directors on our trip were Monty and Michelle. They have both since moved on but we had great time diving with them. Monty won our award for best ever dive brief drawings and he still holds the crown, wherever he is. OPINION Bilikiki isn't a luxury liveaboard but she is extremely comfortable and well run. Extras like soft drinks and Nitrox are charged in addition to the cruise price but with four dives scheduled most days, the trip is great value for money. Bottom 3 images, courtesy of Bilikiki Cruises.